CAMPBELL RIVER, BC, June 9, 2017 — The wait is over! Three lucky winners have been announced in the 2017 Campbell River Hospital Foundation Because You Care Lottery! Winning $10,000 Cash and $10,000 Travel Vouchers from the Travel Place, a trip for two to Royal DeCameron Resort, Cabo San Lucas, Mexico, and a return trip for two to any scheduled WestJet Destination, these three proud supporters are off to a fantastic start to their summers! Thanks to the wonderful support of the lottery’s sponsors: Campbell River Mirror, 997 2Day FM Campbell River​, The Travel Place – Travel Plus, WestJet​, Quality Foods​, and Shoppers Drug Mart​, the Campbell River Hospital Foundation was able to fund vital, state-of-the-art medical equipment and continuing education for its healthcare professionals. And thank you to all the supporters of the lottery! See full article for winner’s names and details. Hurry! 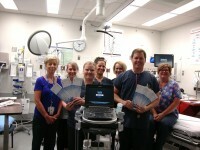 Final Deadline Only Hours Away for the Campbell River Hospital Foundation Because You Care Lottery! Published on May 29, 2017 at 10:37 am . CAMPBELL RIVER, BC, May 29, 2017 — Can you believe May is almost over? What better way to kick off the summer than by finding out you have won $10,000 in Travel Vouchers from the Travel Place, PLUS $10,000 cash to spend however you please! Well, this could be your reality if you are the Grand Prize winner in the Campbell River Hospital Foundation Because You Care Lottery! Or maybe you’ll snag the second prize, which is a seven-night trip for two to sunny Mexico! You’ll receive the all-inclusive treatment at the Royal Decameron Los Cabos, with roundtrip airfare covered (travel insurance not included)! You can almost hear the ocean just thinking about it! Even the third prize winner will be packing their bags, once they choose where they want to go! This prize offers the freedom of following your travel bug, as it is roundtrip airfare for two to the scheduled WestJet destination of your choice. So, will it be New York for a weekend, Montreal for a week, or the Caribbean for… well, you maybe just not want to come back! This is one flight you won’t want to miss, so hurry and grab your tickets before sales end TODAY! Lottery proceeds will fund the purchase of a new ultrasound machine (which costs approximately $50,000) for the Campbell River Hospital’s Maternity Department. Published on May 29, 2017 at 12:00 am . 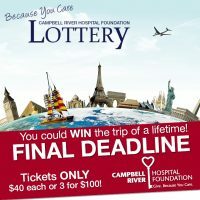 CAMPBELL RIVER, BC, May 29, 2017 — Tomorrow at 5 pm is the very last day to snag tickets to the 2017 Campbell River Hospital Foundation Because You Care Lottery! Don’t miss out on your chance at a spectacular travel prize! Remember- tickets are only $40 or for better odds, grab 3 for $100! Order your tickets today by calling 250-850-2418 or toll-free 1-855-550-2418, or order online. Hurry! This is the last weekend to buy tickets to the 2017 Campbell River Hospital Foundation Because You Care Lottery! Published on May 26, 2017 at 7:38 am . CAMPBELL RIVER, BC, May 26, 2017 — Only days remain to grab your tickets to the Because You Care Lottery! If you’re ready for your next travel adventure, then start packing your bags and make sure to head to their website and buy your ticket before sales end on Monday! What are you waiting for- tickets are only $40, or grab 3 for $100! Don’t miss your chance for a big adventure! Ticket sales close on Tuesday – that’s only four days away! 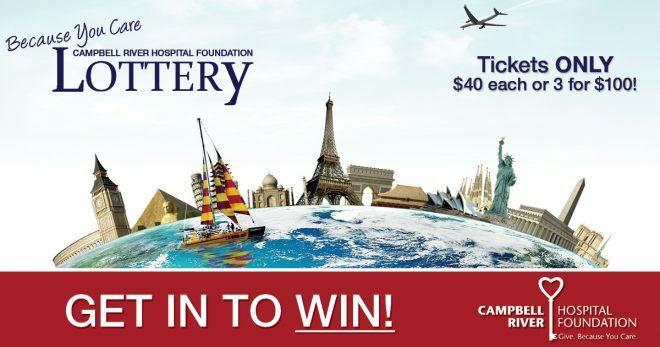 Grab your ticket and see the world with the Campbell River Hospital Foundation Because You Care Lottery! Published on May 19, 2017 at 12:00 pm . CAMPBELL RIVER, BC, May 19, 2017 — Where would you go with $10,000 in travel vouchers, and what experiences would you indulge in with $10,000 in cash? You’ll have to buy tickets to the lottery to find out! Plus, the second prize winner will be off to Mexico for a week, and the third prize winner can go anywhere WestJet flies! What are you waiting for- tickets are only $40 and sales end soon! 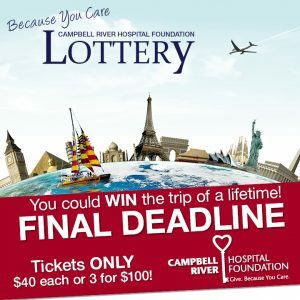 Grab your ticket to the Campbell River Hospital Foundation Because You Care Lottery! Published on May 18, 2017 at 7:37 am . CAMPBELL RIVER, BC, May 17, 2017 — Your ticket purchase will help the Campbell River Hospital buy a new ultrasound machine, and it also may lead to your next travel adventure! The Grand Prize is $10,000 in travel plus $10,000 cash. Second prize sends you to Mexico, and the third prize is roundtrip airfare on the WestJet destination of your choice! What are you waiting for- tickets are only $40! Call 250-850-2418 or toll-free 1-855-550-2418 to order your tickets! Or visit the Campbell River Hospital Foundation Because You Care Lottery‘s website. Published on June 1, 2016 at 12:55 pm . CAMPBELL RIVER, BC, June 1, 2016 — At 60% sold, and the absolute final deadline next week, this is your last – and best – time to order your tickets in the “Because You Care” lottery. Published on May 16, 2016 at 10:40 am . CAMPBELL RIVER, BC, May 16, 2016 — There are just four weeks left to buy your Because You Care Lottery Ticket, with proceeds supporting two departments at Campbell River Hospital; Maternity and Emergency. The grand prize for the Lottery is an enticing $10,000 Cash and a $10,000 Travel Voucher. The 2nd prize is an all-inclusive trip to Puerto Vallarta, Mexico and the 3rd prize is a return trip for two to any scheduled West Jet destination. Tickets are still available and can be purchased online and with various retailers.